This Saturday August 16th, 2014 is the AmericanMuscle Car show at Maple Grove Raceway with a record number of Mustangs! The AmericanMuscle Car Show is in a brand new location at the Maple Grove Raceway this year and it is offering up a staggering amount of Mustangs on display. 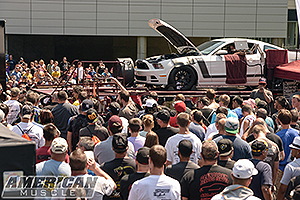 2,000+ Mustangs will be at the show from all over, plus there will be some awesome events and guests at the show that will have everyone in attendance blown away. This year AmericanMuscle is raising money for the Special Olympics, and we are looking to surpass last years $20,000 for Alex’s Lemonade Stand for donations. Aside from all the different Mustang Vendors that will be there, Brett “Big Schwag” Wagner, Chip Foose, and Vaughn Gittin Jr. with the RTR team will be in attendance and signing autographs. Even more exciting than that is Vaughn Gittin Jr’s special announcement at the show, that will be revealed the day of. There are all the different giveaways and raffles as always (over $20,000 in prizes) as well as Project MMD being given away at the show. There will be the BBK revving competition, the Roush Burnout contest, and the Bama Performance Dyno challenge going on through out the day. After the show is over, attendees can race their Mustang at the track for a reduced price. The AmericanMuscle Girls will be joining us at the show and there will be food, live music, and activities for kids too. 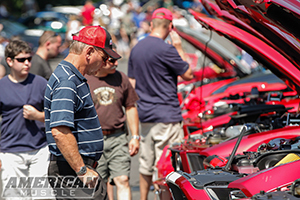 There is something for everyone at show, making the AmericanMuscle Car Show a great time and a great family event. Be sure to join us this Saturday, whether your Mustang is in the show or not; spectator’s can enter the show for free to walk around and be part of this amazing event. Come check out the show and support this great cause! Can’t wait looking forward to Saturday!! !